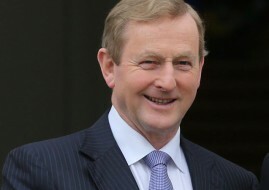 Taoiseach Enda Kenny has admitted it will be difficult to form a new government after a seismic split in the vote in last week’s general election. In his first public appearance since the result of the poll became apparent over the weekend, the Taoiseach conceded he will have to sit down with arch-enemies Fianna Fáil to decide on the way forward. “The numbers in the Dáil make it difficult to form a government,” he said. Mr Kenny’s ruling Fine Gael and junior coalition partners Labour suffered humiliating losses at the election after five years in power administering an austerity programme. An unprecedented schism in the electorate has thrown into disarray the prospect of a new government any time soon. Although the two largest parties, Fine Gael and Fianna Fáil, have enough support between them to form a power-sharing alliance, there is little trust between the pair – whose historic rivalry was born out of Ireland’s civil war more than 90 years ago. Both are also wary of Gerry Adams, leader of the third largest party Sinn Féin, walking into the new Dáil as the official head of the Opposition. The impasse could mean Ireland will celebrate the centenary later this month of its 1916 Easter Rising, a pivotal moment that led to the country’s partition and independence for the Republic, without a government. Speaking at an exhibition marking the rebellion at the National Museum in central Dublin, Mr Kenny refused to be drawn on whether he would prefer a coalition administration or a minority government. “We have not started any discussions about any options yet,” he said. A minority government is one possibility, potentially led by Fine Gael and backed by Fianna Fáil in return for some concessions. Fianna Fáil leader Micheal Martin has called for all parties to sit down at the negotiating table to agree parliamentary reforms in advance of talks to forge an administration. In a statement, Mr Kenny said his Fine Gael party would work comprehensively with the manifold forces, factions and Independents to restore political stability in the “changed circumstances”. 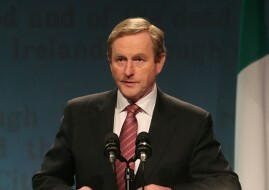 The Dáil is scheduled to resume on March 10 to elect a new Taoiseach. But such is the splintering of the vote, uncertainty hangs over whether the diverse parties and groupings can come to any agreement that would pave the way for a new government.